This is another stop on a new slate of reviews I'll be posting on Nikki-Michelle's Spot. Before I ever had dreams of becoming a writer, I was a reader. That hasn't changed. I love to read. A good book can always take me away like Calgon. 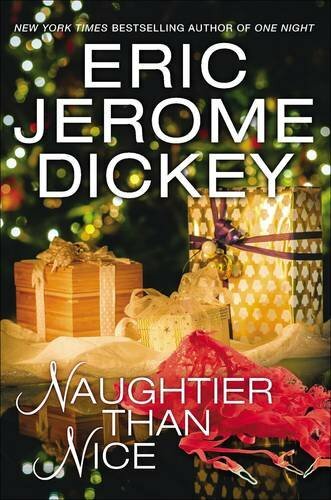 Next up, Naughtier Than Nice by Eric Jerome Dickey. I should note that this book is NOT on Kindle Unlimited. As a reader, I'm a fan of Kindle Unlimited. If you're a reader looking to test a new author, KU is a good investment, especially in this market of....eh, that's a story for a different day. Back to Naughtier Than Nice. Man, whew. I've waited so long for EJD to get back to this style of writing. Now don't get me wrong I love Gideon and the chick from A Wanted Woman, but I longed for the day EJD would get back to the Cheaters and Liar's Game style of writing. Once I read One Night earlier this year, I knew I was going to get Naughtier Than Nice. First off, let me say it did my heart some good to get an update on so many of my fave characters from EJD's earlier works. There was Dante (Thieves Paradise), Driver and Panther (Drive Me Crazy and Naughty or Nice), Dr. Shelby and CEO Tyrel Williams and Dr. Debra (Friends and Lovers). Ducati/Billie (Chasing Destiny), Vince and Dana (Liar's Game) and Regina Baptiste (Accidental Affair). There could have been more, but I can't remember. Either way, this book was everything to me. The book starts off with Frankie giving us a rundown of her life since we last saw her in that post office where she met Franklin. Things went from sugar to S.ugar H.oney I.ce T.ea fairly quickly. Franklin had some overseas secrets and they came out swinging. I kept thinking, 'damn, poor Frankie'...Just when she thought she had it all figured it out... Meanwhile, EJD made me google 'boegroes' and I'm not sure I will ever be the same...Neither will Frankie & Frankie for that matter. We move on to Tommie. Tommie isn't the shy, low self-esteem having younger sister we remembered from Naughty or Nice. She has gracefully come out of that shell. She's still with Blue, our LL Cool J/Common look-a-like. Tommie has the whole sha-bang. She has the man. She's playing mommy to Monica, Blue's young daughter. She has the house. She has everything she's ever wanted except the two things she's desperately trying to get Blue to give her, one of those things which he has all but ensured she will never have. This causes strife, a rift in the happy couple that threatens to crumble their proverbial happy home. Now on to Livvy, the middle sister. We haven't seen her since Carpe left her and Panther in that apartment he had rented for their secret rendezvous. Things have changed for her and Tony, her cheating, lying, paternity test needing arse of a husband since Naughty or Nice. They now play by a different set of rules, rules that Livvy have laid out. And if Tony, the cheating tiger, wants to keep his wife, he will do what she says when she demands it...even if it confuses yet pleases him. Naughtier than Nice gave me everything I needed. This was a reader's dream. Not only did EJD manage to give us an update on the McBroom sisters, he managed to show three Black women still trying to find their way through love without having them become the stereotypical Black woman can't live or function without a man trope. It was also good to see and catch up on other characters even if it was in passing. I also enjoyed meeting new characters like Bill (or it could have been Beale as I listened to the Audible version ) Streets and Daniel Madison. Blue's baby mama, Angela, is still just as irate and irresponsible as she was in book one. Also, it was good to meet Rosemary Paige. One last thing, I knew who the villain was in this book as soon as we were introduced to them. When I tell you that the villain is straight outta the nut house, that's word to NWA. All-in-all, I'm going to rate this book five pages (think five-stars) even though I felt something was missing near the end. I'm not sure what it was and since I can't put my finger on it, I won't let my personal feelings take away from the fact that this book was well written with an action packed beginning, a blood curling climax, and simmering ending. Nikki-Michelle recommends this book. Love the book and your review is spot on! Thanks Nikki! If you figure out what you felt was lacking, let me know. It's always interesting to know. Hugs! I sure will! Thank you so much for stopping by! I'm humbled. hi Nikki . this book is really interesting . i hope i will enjoy it .